This is our sharpest tool in the shed, developed with one task in mind: to dominate the street. A true rider knows that here, power needs precision. Feedback. Poise. 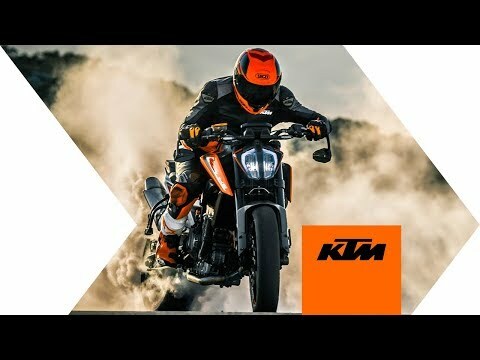 That’s why KTM combined a light, state-of-the-art chassis with the new LC8c engine. The result: plenty of torque on tap, a 105 hp rush blasting out of corners and a huge grin on your face. In order to slingshot this telepathic lightweight even further ahead, advanced ride by wire, integrated connectivity options and next-generation rider aids are here today. But that’s not the end of it. Imagine an up and down quickshifter that takes its name extremely seriously. Customized ride modes. Personalized traction control. And a lean, mean KISKA design that’ll make you learn to love waiting for the others as you raced ahead. BODYWORK & GRAPHICS: Purity is one of KTM’s brand values, and in a design context it means not using unnecessary design elements when a simpler option is possible. Or when you can combine multiple functions in one part. Take the tank spoiler, which combines the functions of spoiler and ergonomic surface, for example. Or the taillight that’s been mounted on the license plate holder, so it can be easily removed for a day at the track. This is a bike that looks and feels as compact as possible. You’ll find no round shapes, but straight lines, clarity and the promise of a radically thrilling ride. CHASSIS: Purity is the focus here. All components have been reduced to the bare essentials. There are no unnecessary parts or covers. The engine, for example, doubles as a load bearing element, the frame is made of extra strong CroMo steel so less material is needed, and components were developed to combine functions wherever possible. EXHAUST: A stainless steel thing of beauty. The middle damper centralizes mass and allows for a relatively small muffler that plays a dramatic soundtrack to possibly huge lean angles. Hundreds of test bench runs and complex simulations ensured that this exhaust system contributes decisively to the tractaENGINE: Built for torque, this liquid cooled 8 valve unit delivers 86 Nm at 8000 rpm, almost immediately followed by a roaring 105 hp finale. Meanwhile, an advanced ride-by-wire system guarantees great refinement as well as low fuel consumption and emission figures.ble torque curve and excellent emission values. SEATS: At 825 mm, both shorter and taller riders can enjoy the bike at full tilt, without losing sight of the daily usability. The seat cover is grippy but still allows the rider to move around the bike easily. It has been developed to work with textile and leather, in keeping with the wide range of riders and riding styles. The pillion seat cover uses the same material and combines sharp looks with passenger comfort. FOOTPEGS: The cast aluminium footrests cater to a comfortable riding position, while still creating maximum ground clearance to allow for a high lean angle. Reverse (race) shifting is possible without any additional parts. 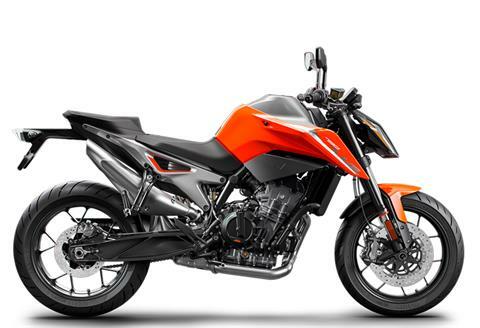 SOFTWARE & ELECTRONICS: The KTM 790 DUKE comes with some serious brainpower as standard. Even when you’re flirting with the limit, KTM’s combination of the most advanced software and electronics in the world of motorcycling will have your back. All you have to do is focus on the road ahead - and hold on tight. RIDE MODES: Ride modes regulate the performance output and the ‘character’ of the motorcycle according to riders’ preference. The riders’ throttle commands are electronically translated into throttle valve positions perfectly suited to the riding conditions. The various ride modes control several things at the same time, while the Track mode allows the rider to adjust individual settings for a number of features. The four ride modes are: 1. Sport: has the most direct throttle control, allows respectable drifts and a perceptible amount of slippage. 2. Street: keeps things smooth for comfortable, controllable riding. 3. Rain: is all about early intervention and maximum grip in the wet 4. Track: customize your ride, dial down the traction control, smooth out the throttle, switch off the anti-wheelie.